What do you believe at Wesley United Methodist Church? Our mission is to help people cultivate a growing, personal relationship with God through Jesus. Our vision is to be empowered and nurtured in a growing community of faith, inviting, attracting and serving families and people of all ages. What are the Sunday worship services like? 8:30 a.m. service features mostly contemporary Christian music led by our Wesley Praise Band, along with some updated hymns. 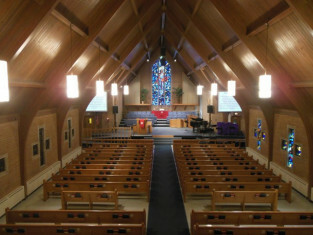 11 a.m. service has traditional organ and choir music. 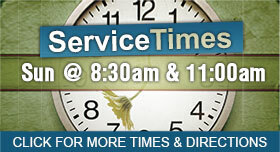 The reading and sermon are the same at both services. During the 8:30 service, children are dismissed to go to Children's Church or Praise Kids choir practice (first through sixth grades). Wheelchair seating and voice-amplification devices are available. No. You will not be asked to stand or introduce yourself. We hope you will fill out a Connection Card, found in the Sunday bulletin, with your contact information so we can follow-up on your visit by mail or email. You also can find information at the Welcome Center in the atrium. There are parking spaces designated for visitors and people who need handicapped parking spaces in the lot on the east side of the church. A larger lot with handicapped and limited-mobility parking spaces is on the west side. From there, you enter the lower level. On Sunday mornings, a greeter can take you to the elevator if you need it. Friendly greeters and ushers meet people at the atrium and sanctuary entrances on the main level and both lower-level entrances. Fellowship time with coffee, lemonade and donut holes begins at 8:00 a.m. and lasts until 11:00 a.m.
We celebrate Holy Communion at both services the first Sunday of each month. United Methodists practice “open-table” communion. You do not need to be a member of our church to participate. Anyone who desires to grow closer to Christ and one another may receive the sacrament. Yes. There are classes for all ages. Adults can choose among classes doing Bible studies, book studies and topical studies. Yes. Our nursery provides care for infants through 5 years old from 8:15 a.m. to 12:15 p.m. Sundays and 5:30 to 7 p.m. Wednesdays during Faith Encounter, and at other times for special events. Nursery workers have completed CPR and first aid training. Yes. 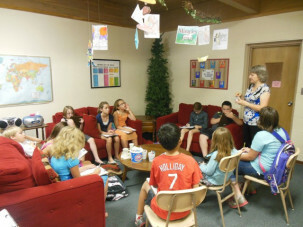 Faith Encounter is from 5:45 p.m. to 7 p.m. Wednesdays during the school year. It consists of a meal, praise songs and a brief message. The Connection Cards distributed on Sunday mornings have places to request more information, and Coffee with the Pastor is scheduled occasionally.